Head and neck cancer is the 6th most common type of cancer in Europe with more than 150,000 new patients diagnosed in 2012, and the incidence of the disease is on the rise. 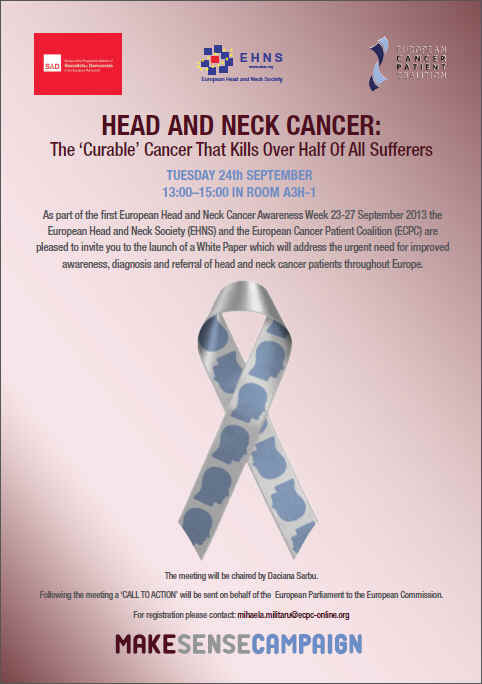 There is little awareness of head and neck cancer among the general public and the healthcare community in Europe, meaning many cases are identified in the late stages which drastically reduces the patient’s chance of survival. Despite major advances in the treatment of head and neck cancers over the past three decades, patient outcomes remain disappointingly unchanged. Therefore, action must be taken now to save lives. - Support a multidisciplinary approach for head and neck cancer treatment. EHNS and ECPC are committed to the Make Sense Campaign and its goal of improving outcomes for patients with head and neck cancer. They will continue to invest in education and awareness activities targeted at their key stakeholders to ensure they meet their goal.